Installing rubygems is failrly easy and it’s great to have a package manager so you can forget about manually installing and upgrading the components you use. After installing a gem, you can require it from any ruby script and use it hassle-free. Well, given your ruby interpreter can find it. Unless you are on windows, you have probably experienced already that gems can get installed in different locations. If using a superuser account, the global configuration will be used, but with a regular account gems install under your home directory. If you are not careful about how you install your gems, or if you are using rake gems:install from regular accounts, you might end up installing the same version of a gem twice. That’s not only WET (not DRY, bear with me here) but it eats up your poor HD. Things can get a lot worse than that. Suppose you are working with both JRuby and Ruby MRI. When you use rubygems from JRuby, it will try to use a different gem location by default. So, depending on how you are installing gems, you could have up to three different copies of exactly the same version. And if you are on ubuntu and you upgrade from an old version of rubygems to the latest one —you will have to if you install Rails 2.3.4; if you are having problems you can read right here how to update it— you might be surprised that your gems are being installed *again*. The reason is under older versions the default location was “/var/lib/gems” and the latest one defaults to “/usr/lib/ruby/gems”. Well, four different copies of ActiveRecord 2.3.4 are three and a half more copies than I wanted, mind you. So.. how can we stop this gem install frenzy? Easy. Don’t use the defaults. Each of your installations is using default values, but they can be easily overridden with command line parameters or much more conveniently with environment variables. Remember the title of this post? Can you see anything there that would make a good candidate for environment variables? That’s right, all the rubygems versions honor the GEM_HOME and GEM_PATH variables, so if they are set they will be used. Depending on your OS, you can set these variables in different places. I’m on ubuntu and a bit lazy, so I chose the easiest, which is by adding this to my .bashrc file. And now, no matter what I’m using: Ruby MRI, JRuby, or the latest rubygems, my already installed gems will be used, and the new ones will be put in the same place. Saving the world is a hard job, but someone has to do it. I spent last Saturday hacking around with some really smart people in Madrid. 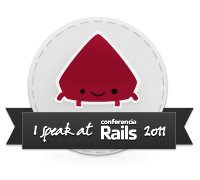 It’s not widely known than in Spain there’s a thriving Ruby on Rails community -my guess would be a language thing- but if you take a look at some of the Rails patches, Hackfest winners or the official Rails documentation project, you would be surprised to see how many -and how good- contributions are coming from this side of the world. As you know, developing software in windows while entirely possible is a bit more difficult than in other systems, specially when it comes to compiling, forking and the like. Last Saturday I was, as usual, the only windows at hand (the rest being a lot of Macs in different flavors and a lonely Ubuntu) and, as a part of the code challenge, I had to run some tests with Cucumber, Selenium and Webrat. Apart from libxml, that has been working flawlessly in my computer for months, no other binaries were involved, so you would think everything was working just fine.. well, think twice. First problem was the test server couldn’t be started automatically. I didn’t investigate much about it (my guess being that a fork or a system call is being issued and Windows cannot cope with it) since it was easier just to start it manually before running the tests. Also it was faster, because it didn’t need to be started every time. After this obstacle, when I was trying to run the tests, I was getting a cryptic Errno::EADDRNOTAVAIL message. At first I thought it was because of Selenium not being able to bind to the given port, but a quick test from the command line discarded that possibility. I don’t know anything about webrat (yet) but as the song goes, with a little help from my friends I was able to locate the source of the problem. When connecting to remote control Selenium, Webrat is trying to bind to the address “0.0.0.0” and that’s something Windows doesn’t like. All I had to do was opening the file “selecium_rc_server.rb” at the gem source and replacing “0.0.0.0” by “127.0.0.1”. Once I did this, all was hunky dory. Selenium started, the form fields were filled in, the tests were passing (or not) and the result was displayed on my not-ansi console. Bummer. Believe me, cucumber is not half the fun without the colors in the output. Fortunately enough, google can tell you where to find lots of ansi-aware console replacements. Unfortunately enough console2, my favourite, is not one of those. So, there, it took a bit of extra work but now you can also run this neat stack in your good-old windows box. Rails 2.1 mola.. la verdad es que trae un buen puñado de funcionalidades interesantes… yo le estoy sacando ya partido, por ejemplo, a los dirty objects (molarían aunque sólo fuera por el nombre) que son especialmente interesantes en callbacks y observers. Una vez pasado el shock inicial, intentas volver a instalar… y cuando ya ves que no, buscas en el plugin google a ver si hay suerte y por lo menos esto le pasa a alguien más… y, efectivamente, hay más gente a la que le pasa.